Dr. Khalid Kamal has been elected as the Chair Elect for the Faculty Advisory Council within the International Society for Pharmacoeconomics and Outcomes research (ISPOR) organization. The chair-elect position begins July 1, 2017 for 2 years, after which time he will become the chair for an additional 2 years. This is an advisory council to the ISPOR Board of Directors and the mission of the council is to facilitate the educational and professional development of students worldwide in pharmacoeconomics/health economics and outcomes research. ISPOR is the leading global scientific and educational organization for health economics and outcomes research and their use in decision making to improve health. ISPOR is committed to strengthening the integrity, advancement, understanding, and use of health economics and outcomes research among researchers, health technology developers and assessors, regulators, health economists, health care policy makers, payers, providers, patients, populations, and society. Dr. Kamal is an Associate Professor in the Division of Pharmaceutical, Administrative and Social Sciences at Duquesne University School of Pharmacy. He completed his Bachelors in Pharmacy (1994) and Masters in Pharmacology (1996) at Mumbai University, India and received his PhD in Health Outcomes Research (2005) from the Department of Pharmaceutical Systems and Policy, West Virginia University. Dr. Kamal has been on the faculty of Duquesne University since 2005. He has been a Visiting Professor teaching pharmacoeconomics and decision modeling courses at institutions such as Kobe Gakuin University in Kobe, Japan and West Virginia University School of Pharmacy, Morgantown, WV. He also completed the American Association of Colleges of Pharmacy Academic Leadership Fellows Program in 2014. 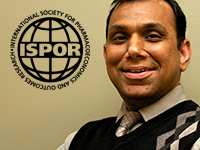 Dr. Kamal serves as the faculty advisor to International Society for Pharmacoeconomics and Outcomes Research (ISPOR) and Academy of Managed Care Pharmacy (AMCP) Student Chapters at Duquesne University School of Pharmacy.